This post was originally created on 9th April 2018, and has since been updated to include all the latest boots for 2019. So, your kids are football mad, are they? In this day and age, this shouldn’t really come as a surprise. After all, there seems to be a match on the telly just about every night of the week, so it’s only natural for the kids to take an interest sooner or later. Of course, an interest in football certainly isn’t a problem. We’re all football mad ourselves at FOOTY.COM, and we’ve all turned out okay (for the most part). No, the problems only arise when it comes to buying the little nippers a new pair of football boots. There are just so many options out there. Different brands; different materials; different surface types; different sizes; different colours- you get the picture. When you aren’t really keen on football yourself, all of these things seem like a foreign language, and we wouldn’t blame you for feeling a little overwhelmed and just buying the cheapest pair you can find. However, if your kids are going to make an impact on the pitch, then you’ll need to find them the perfect pair of boots to play in. So, let’s get started, shall we? If there was a quick and easy answer to finding the best pair of boots for your kids, then we’d give it to you. Sadly, no such answer exists- since every child is different and will have their own unique requirements. Whether they have wide feet, play in a certain position or favour a particular colour, all of these aspects need to be considered when picking out the perfect boots. Of course, you’ll know your child better than anyone, so you just need to think about what they’d like. Simple. If they like to play as a striker, then there are boots that help their finishing; if they’re incredibly quick, then there are boots that let them sprint in comfort; if they enjoy passing, then you can find boots that enhance ball control and accuracy. In short, there are kids’ boots out there for every position and every style of footballer. Seems a far cry from the days of all black hand-me-downs, eh? . Many parents worry about finding the right sizes, too- which is understandable when the kids just won’t stop growing and boots are expensive to replace. If your kids are in between sizes, we always recommend getting the next size up, so that they can grow into them instead of needing them replaced just a couple of months down the line. What Are The Different Surface Types? The different surface types can cause all kinds of confusion. With boots labelled with things like FG, AG and SG- you’d be forgiven for wondering what on earth it all means. Well, these little acronyms all relate to the different surface types, since the big brands now make their boots available for all kinds of playing surfaces. FG= Firm Ground. These boots are perfect for harder grass surfaces in the summer months. SG= Soft Ground. Ideal for grass pitches throughout the winter months. Great for wet and muddy conditions. AG= Artificial Ground. The perfect choice for kids that play on artificial turf. Softer studs. 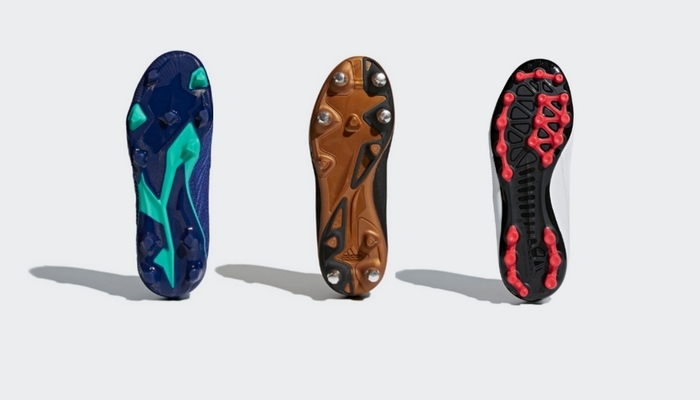 Which Football Boot Material Is Best For Kids? Kangaroo leather (or K-leather) football boots are the most popular form of leather in 2019. It offers a soft and flexible fit that just isn’t possible with other kinds of leather and is perhaps the most durable surface type available. 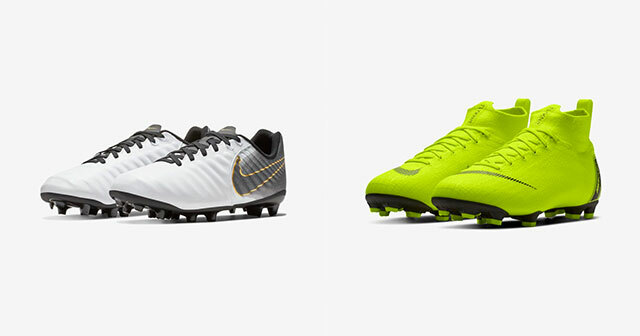 The adidas Copa and Nike Tiempo are the most popular boots that still utilise a leather upper. Kids’ Synthetic Football Boots: Synthetic football boots are all about reducing weight. Leather may be incredibly comfortable, but it can also soak up a lot of water in wet conditions and become heavier. Of course, this will impact speed. Synthetic boots offer the comfort of leather within a lightweight construction- and are currently the most popular type of football boot on the market. 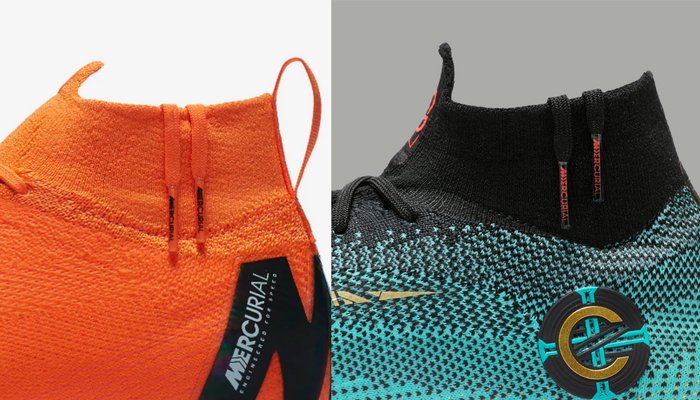 The latest evolution in synthetic boot tech, knit football boots offer enhanced control and are designed to feel as though you aren’t even wearing any football boots. This barefoot feel is achieved through an upper made of yarn, as the big brands continue to build on these innovative designs. 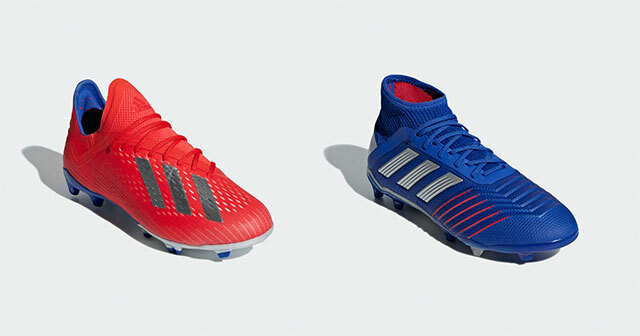 The adidas Primeknit and Nike Flyknit boots are incredibly popular with kids and professional players alike. What Are The Most Popular Kids’ Football Boots In 2019? There have been some absolutely massive boot drops already this season, and it can be hard to keep on top of what’s currently popular. 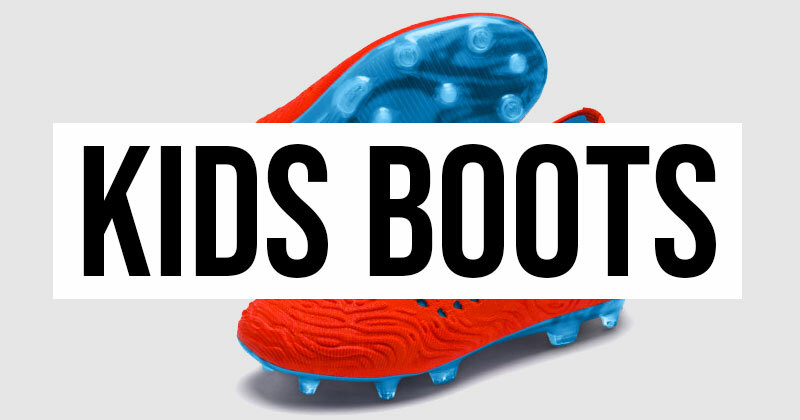 The biggest boot brands are constantly releasing new models and colourways, so what are the hottest kids’ boots right now? Ever since its re-release at the end of 2017, the adidas Predator has taken the world by storm. These stunning football boots offer a terrific blend of comfort and style; absolutely perfect for any kids that love to control the game and dictate the play. If your children ever ask for a pair of “Pogba boots”, then they probably mean the Predator. Available in a range of gorgeous colourways, the “Exhibit” Predator (pictured) is what all the kids are talking about right now. The adidas X (as worn by Mo Salah) are also very popular in this red colourway, while the adidas Nemeziz is the perfect choice for any big Lionel Messi fans out there. For any parents that are looking for a real all-rounder of a football boot, then the Nike Jr. Tiempo might be right up your street. Still utilising its classic leather upper, the Tiempo offers fantastic comfort and an enhanced first touch. The ‘Fast AF’ colourway is the most recent design, but your kids might be just as happy sporting a slightly older model of this old favourite. The Nike 360 Mercurial Vapor is also absolutely massive right now and the perfect choice for kids that want to show off the most innovative boot tech around (since they utilise Nike’s incredible Flyknit technology). Alternatively, any big Cristiano Ronaldo fans can pick up a special-edition CR7 version of the Mercurial. 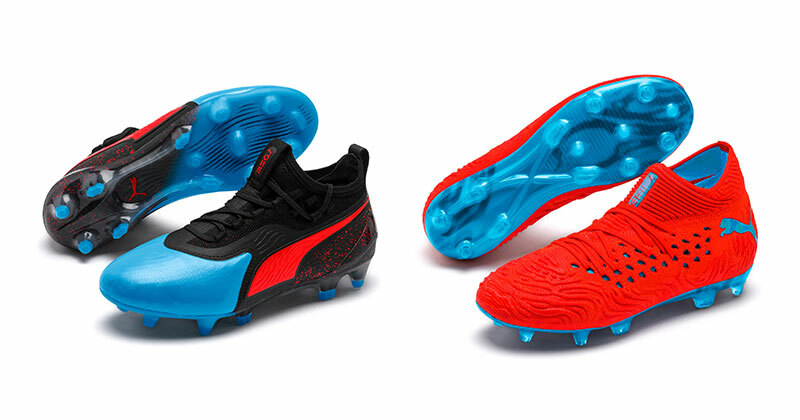 Laceless football boots have been all the range for the past couple of years, but Puma are doing their best to bring laces back with a bang. The innovative Puma Future makes use of the ground-breaking Netfit technology that has been such a huge hit for Puma’s trainers in recent times. This gives players an endless number of ways to tie their laces, offering a level of comfort that’s hard to find anywhere else. These boots are worn by Antoine Griezmann and Marco Reus, with an evoKNIT sock offering an incredibly snug fit. Very comfortable indeed. Which Colour Should I Go For? In 2019, kids want their football boots in just one colour: gold. These flashy, flamboyant designs have been the talk of the playground for the past few months, as kids dream of emulating their favourite players. With the likes of Mo Salah and Paulo Dybala regularly showing off the gold adidas X, kids have been going crazy for gold football boots all year. Alternatively, all-black may be the way to go if your kids are involved in a training academy or a team that don’t allow flashy boots. There are various Academy boot packs available from Nike and adidas, which are perfect for any kids that need a smarter pair of boots for their locker. Where Can I Find The Best Deals On Kids’ Football Boots UK? Fortunately, we make it easier than ever to find the best deals on kids’ football boots in the UK. As the leading football price comparison site, you can browse our selection to find the lowest prices and the biggest bargains. Find the perfect football boots at the best price right here with FOOTY.COM. It’s back to school time so we’ve chosen the best black football boots for school at the lowest prices.